Thursday 29th March is Piano Day. 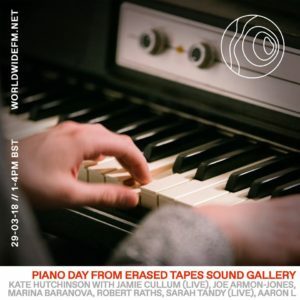 So to celebrate, Worldwide FM is broadcasting a three-hour show (1-4pm) from the Erased Tapes Sound Gallery. The show will be hosted by Kate Hutchinson and will include a live performance from Jamie Cullum. There is a whole host of activities taking place, free entry from midday to midnight at 174 Victoria Park Road, London E9. On-demand will be available after the first broadcast on 29th March.